There's no question that Godzilla and the other kaiju are beings of mass destruction. When they do battle, civilizations crumble. That was the case when they rampaged across the planet before suddenly disappearing. Twenty years go by without a peep from the giant monsters. Then, just as whatever is left of humanity has begun to rebuild, they return. 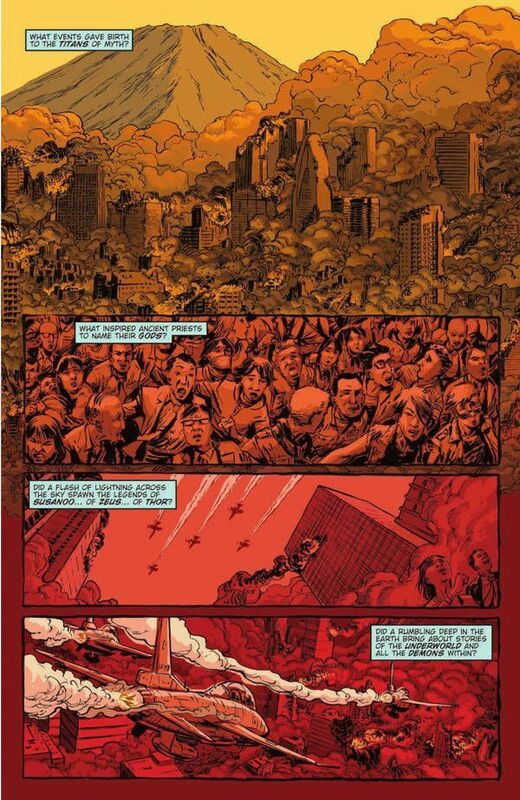 Godzilla: Cataclysm is about to kick the human race while its down. What's unique about Godzilla: Cataclysm is that it begins in a world where the monsters exist only in memories. There's a whole generation of children that only know of them from stories told by their elders. To them, the world has always been like this. They've never known the fear of looking up and seeing a creature the size of a skyscraper stomping towards their home. The older folk remember it all too well though. They warn the children at every turn, but the real danger seems to have passed when the monsters disappeared. 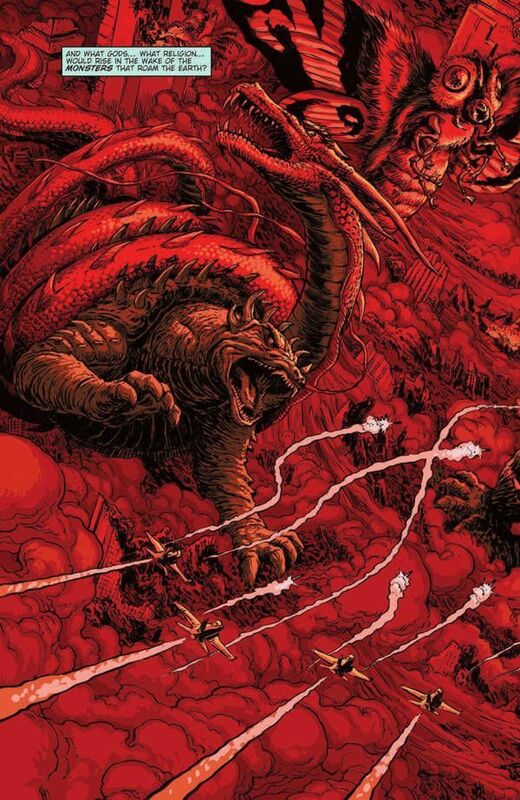 The humans are not much more than bystanders to the battles held by the kaiju. Any attempts that they make to fight the beasts is seen as little more than an annoyance. They're bounced around like pinballs, trying to cobble together some semblance of a life amidst all the carnage. Cataclysm adds insult to injury by luring mankind into a false sense of security for two decades before bringing the monsters back for more. What's going to be interesting is seeing how this current generation deals with the creatures without the support of the military or any other form of major weaponry. 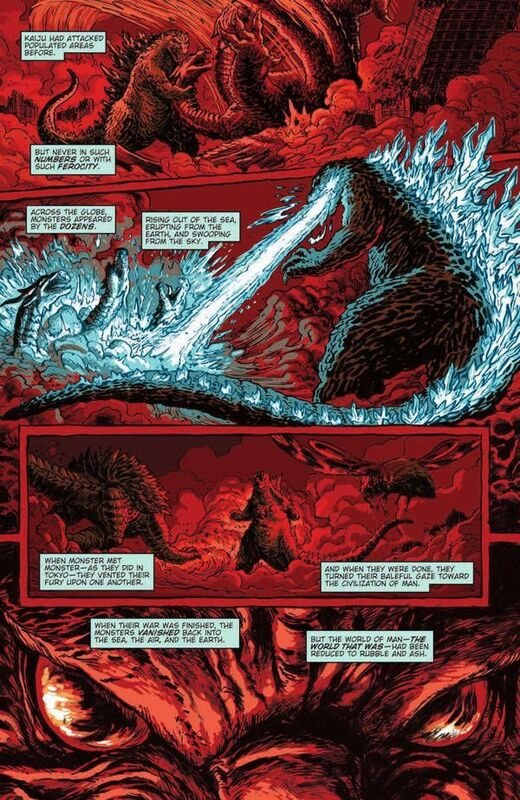 Artist Dave Wachter adds a level of terror to Godzilla: Cataclysm. The first half of the book looks normal, albeit in some harsh conditions. A small group of people have found refuge on the outskirts of a city in ruin. They're living in ramshackle sheds and getting by with what they can salvage from the wreckage. A routine hunting party goes into the city looking for supplies when they come across a mauled corpse of a bear. That's when things get scary. At first, the monsters are heard but not seen. The characters react to the sounds in fear as they begin to get picked off one by one. Three pages go by before a horde of giant mutant bugs are revealed. It's like coming face to face with death. There's no hope in that panel. These people are staring up at their own demise. 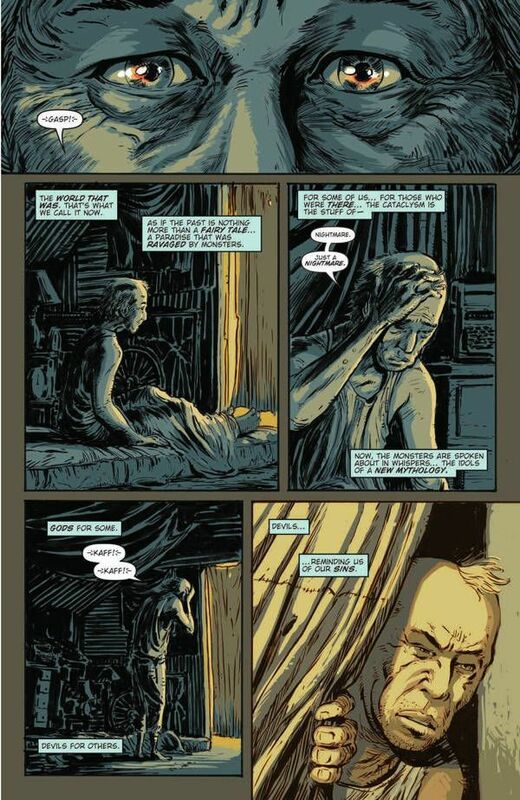 This feeling begins to creep in around them, especially when a pair of them takes shelter beneath some rubble. The sound effects almost take over the entire panel as the monsters tear through the wreckage looking for the humans. It's a nice effect that amplifies the tension of the scene. 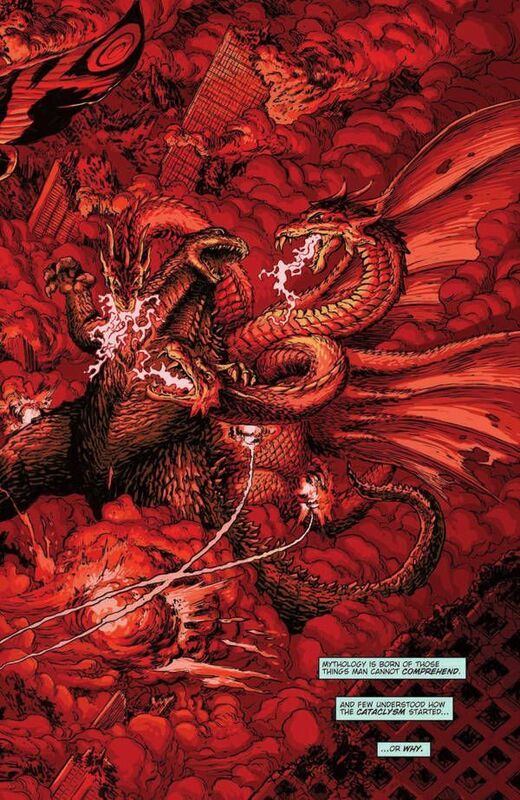 Godzilla: Cataclysm brings back monsters in a big way. Humanity is still incredibly screwed when these beasts get moving, but you can't help but watch the destruction unfold. Now a new generation gets to witness the terror of a huge lizard creature rampaging through its city.